The week before Memorial Day, my family had to say a very unexpected goodbye to a very special friend. My parents’ dog Sage lost his brief, but heroic battle against an illness – whose cause is still undetermined – only days before I returned home for the holiday weekend. 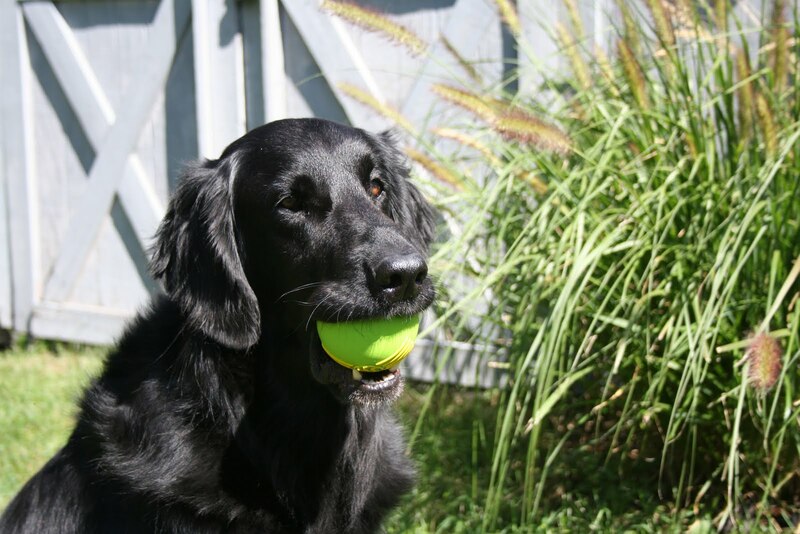 I already introduced you to one of those special dogs, Buck, who was our very first Flactcoated Retriever. 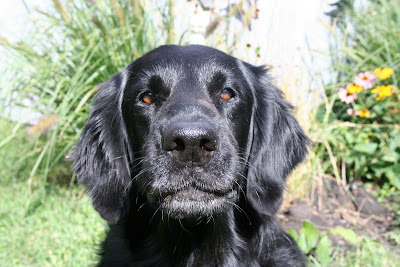 Well, Sage (also a Flatcoat), was another one of those dogs. When he fell ill, I kept the highest of hopes that he’d recover quickly so he could keep spreading his special kind of joy to the world. 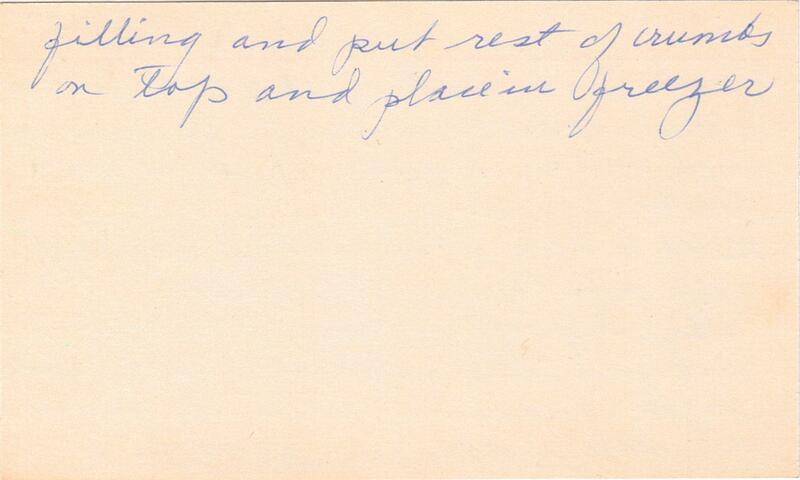 But when I heard from my parents that he had lost his valiant fight, I was in shock. I couldn’t believe I’d never bury my face in his soft ears again, never hear him “woo woo” at me when I walked in the door, never cuddle up next to him, scratch his head and literally feel him radiate happiness. Sage, like Buck, was the kind of dog who not only left a paw print on your heart, but also a gaping hole in it when he left. He was one of those dogs who was truly man’s best friend – a friend you’d long to see at the end of a rough day, a friend who would make all your worries wash away, a friend who you’d remember forever. I still get a pang of sadness when I think about Buck. And I know it will be the same years from now when I remember Sage. You didn’t have to be a dog lover to appreciate how special Sage was; even people who weren’t all that fond of flying clumps of dog hair, sloppy kisses or barking loved that dog. There was something about him that just changed the mood in the air when he walked into a room. It was as if he had special powers and could just emanate happiness (for all you Twilight fans, he was basically like Jasper and had the power to change your mood). And you couldn’t help but chuckle when you watched him clumsily run across the yard – his legs flailing about, ears flapping in the wind, tongue hanging out and a look of childlike giddiness spread across his face. Graceful he was not, but that dog truly knew how to enjoy life. 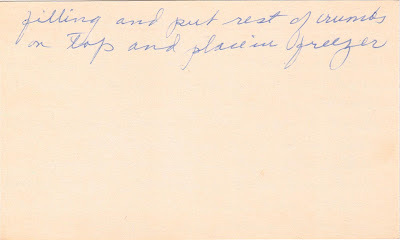 So when I dove into the box in search of a recipe to make in his honor, I knew it had to be something pretty special. 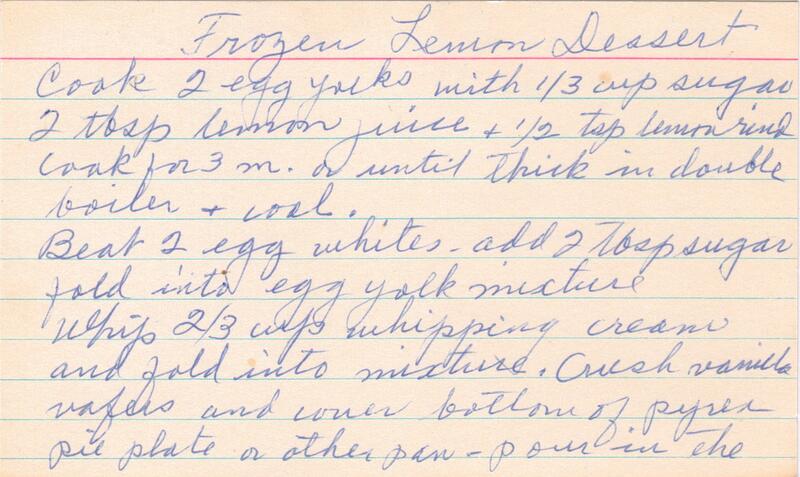 It took some digging, but I eventually found the perfect dish: Frozen Lemon Dessert. This worked on several levels. First, one of Sage’s favorite treats was ice cubes. Not because he liked to eat them, but because his favorite pastime was making a mess and next to tearing up Kleenex or digging holes in the yard, these proved to be perfect tools for accomplishing his goal. Whenever he got one, he’d carry it into the dining room and chew it into pieces, which he then left to melt on the floor. You’d think we’d learn to stop giving the dog ice cubes right? Not when you saw the look of pure bliss on his face as he bounded off with the coveted treat tucked into his lips. How can you deny him such happiness? So the fact that it was a frozen dessert was a perfect choice for Sage. Second, he was the sweetest dog I’ve ever met. Honestly. He could turn even the bitterest moment into something heartwarming. And that’s just what this dessert did to the lemons. 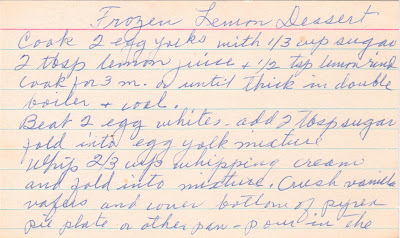 On their own, lemons make your mouth pucker and choke, but mix them with a little sugar and whipped cream and your lips curl right into a bright smile. This is a pretty simple dessert to make and doesn’t take much time at all. I only made one change and used graham crackers for the crust instead of the vanilla wafers. After a short time in the freezer, it was ready to serve. Each bite filled me with warm memories of Sage and left a cool hint of lemon on my tongue. It was the perfect way to honor his memory. As a tribute to him, I even thought about leaving chunks of ice cubes on the floor, but the warm temperatures would have quickly melted my memorial and left only a big mess to clean up. And that just isn’t as much fun to do when Sage wasn’t the one who made it. I miss you so much, Mr. Sage. I still can’t believe you’re gone. I keep hoping to wake up from this terrible dream and hear you in the background when I’m talking to mom and dad on the phone chewing your squeaky ball and annoying the bejesus out of everyone within ear shot (he could chew those obnoxious toys for hours and never get bored, it’s amazing he didn’t go deaf). But as I said when Buck died, life can be cruel sometimes and insanely unfair. Such a sweet life certainly didn’t deserve such a tragic and untimely end. You touched many lives though, and your love lives on in all of us, especially my sweet Dorie who I know misses you more than any of us. You will always be my friend, Sage, forever and ever.